Babies are always moving and kicking their legs, so why not put that energy to good use by plopping them in a baby jumper? A jumper will allow them to experience some excitement, get some exercise, and, perhaps most importantly, give you a much-needed break. If you’re shopping for a baby jumper, you’ve probably realized the market is pretty flooded. But don’t worry — we’ve picked out the best, and rounded up everything you need to know to choose the right one for your home and baby. Use the links above to check the latest prices or read our in-depth baby jumper reviews below. Why Do I Need a Baby Jumper? A baby jumper is an activity seat affixed to an elastic harness, which allows your baby to use their legs to propel themselves up and down. Bouncers, which are not to be confused with infant bouncy seats. Activity centers, which should not be confused with infant play mats. There are several types of baby jumpers available. Perhaps the most common thing you picture when you hear the term jumper, is a baby seat that attaches to the frame of a door. The baby is secured in a belt or harness, and they’re able to jump up and down in the doorway. Single-use item; no additional activities for entertainment. This design is similar to a doorway jumper, but it comes with its own frame so the whole thing sits lower to the ground. This means it’s more versatile because you can use it in spaces that don’t have a door frame or even outside. It’s also safer as the bungee cord is not as long and can not swing your child as far. Easier to store than an activity center. Safer than a doorway jumper (source). Can be used in more spaces. These jumpers are also known as exersaucers, which is a brand name made by Evenflo. 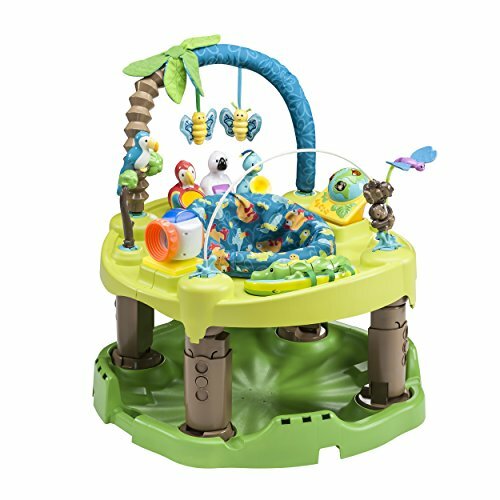 They not only feature the ability to bounce, but provide additional entertainment as well with buttons to push, rattles to shake, along with other attention-grabbing toys and features that will keep your child busy even after they’re done jumping. May be overstimulating for some babies. Age/size limitations: Choose one that will work for your baby’s age, weight, and height. Adjustable height: Make sure the height of your jumper is adjustable, so you can ensure their feet are optimally positioned on the floor for proper development. Product size: Pay close attention to the product dimensions. If you don’t have much space in your home, you may opt for a doorway jumper instead as full-size activity centers have a rather large footprint. Bungee cords: If choosing a doorway jumper, choose one with dual bungee cords or a shorter single strap length for maximum stability and to minimize the risk of injury to your child. Washable seat: It’s a fact every parent knows — your child will have a diaper explosion while in their jumper at least once. There’s something about the positioning and the leg activity that stimulates a bowel movement, so choose a jumper with a seat that can be washed easily — either by throwing the whole seat in the wash, or with a plastic exterior that can be wiped down and sanitized as necessary. Now that you know how to find a quality jumper that will grow with your baby, the safety precautions to be aware of, and exactly what to consider when buying, let’s take a closer look at some of the most popular brands currently on the market. An activity jumper is super versatile — not only can it be used as a jumper, but folded flat it can be used on the floor, and your babe can even use it as motivation as they learn to pull themselves up to stand. Plus, with all the fun toys and attachments that come with them, it’s basically like a baby amusement park right in your own living room. 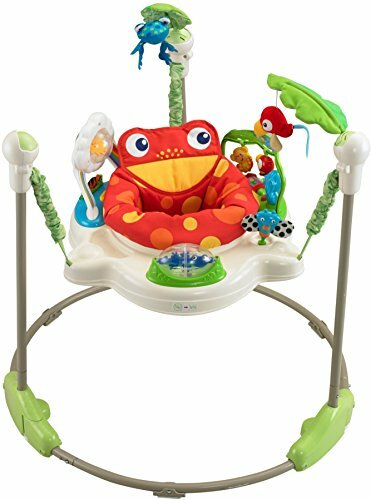 From your babe’s jumping feet to the birds dangling overhead, this bouncer is three-dimensional fun. Plus, lights and sound reward your child for jumping and spurs them on toward more fun. It has a light-up musical piano that babies should especially enjoy. The seat fully rotates, and the springs that facilitate jumping are covered to help prevent pinched fingers. When you don’t want to keep it in your living room, the frame folds in on itself to shrink the size and make it more compact. Because moms are constantly thinking about clean-up and safety, they should be relieved to know the soft seat pad is removable and washable, and the plastic that it’s made of is BPA free. It has sounds and lights to motivate baby to jump. It has many different toys to grab baby’s attention. The seat is machine washable. It does not store flat. There are only three adjustments for height. If you’ve got a future linebacker on your hands, you want a jumper that can handle them. Choose one with a good-sized seat that has an adjustable belt, large thigh openings so they can stay comfortable, and a high weight limit so they can use it for as long as possible. This jumper will accommodate a large variety of baby sizes as it has five different height settings, and the weight limit is 25 pounds. The seat can spin 360 degrees so your child can easily reach any of the tempting toys, which will keep them occupied for hours. The seat cushion is removable and machine washable in the event of accidents, and everything else on the jumper can be wiped down and sanitized as it’s hard plastic. You can hang additional toys off of loops on the jumper, giving you the opportunity to personalize the jumper and mix it up when they start to lose interest. Finally, even though it’s rather large, it can fold flat for storage — it may even be able to fit out of sight under a bed or crib. It will hold baby’s attention. It has five height positions available. If you expect to take your jumper with you on the go, you probably don’t want a bulky activity center. A doorway jumper is the most portable — and most economical — bang for your buck. But if you think you might be taking your jumper somewhere that doesn’t have a place to affix it safely, you might want to opt for a stationary jumper. This baby jumper is not as compact as a doorway jumper, but is much more versatile because it doesn’t require a doorway. Because of its simple fold-flat design, it’s perfect for on the go — whether that’s to grandma’s house or on your next camping trip. It will fit in the trunk of your car, which still allowing you enough room for your other luggage. The stand was designed to facilitate better jumping action, but because it’s on a free-standing frame you no longer have to worry about the risk of your child running into the door frame and harming themselves. The seat itself is made in a saddle design which helps keep your child in their correct posture, providing the appropriate support to their spine while jumping. It is safer than doorway jumpers. It is not versatile because it doesn’t have any toys attached. It is not as compact as doorway jumpers. If you’ve got a petite babe on your hands, you want to make sure they can be safely secured in a jumper. Choose one with an adjustable belt or harness, smaller leg holes they can’t slip through, and with a lower weight/height threshold so you know it’s been manufactured with them in mind. Unlike many of the other bouncers, this one’s seat more closely resembles a wearable harness. This means it fits closer to your child’s body to prevent them from falling to one side or another, which is of particular concern if your child is smaller than average. However, even if you have an average- or larger-sized baby, this product should work, too, as the upper weight limit is 28 pounds. Since it’s a door jumper, it secures to the door frame and molding, meaning it won’t take up valuable real estate in your living room. It also stores well using minimum space. 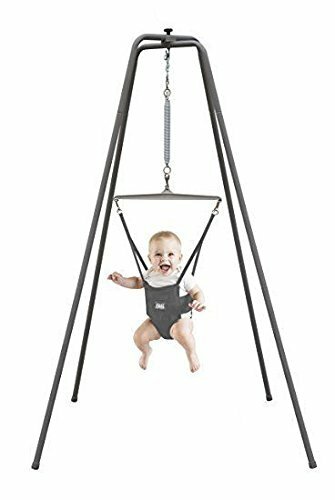 The height is adjustable by using more or fewer chain links, and the design is such that the baby will experience enough jumping action to have fun, but cannot bounce so much that they may injure themselves. Seat fits tighter to the body. It’s good for small spaces. It is a unisex design. Your door and frame must fit certain specifications. The spring is exposed, which could lead to pinched fingers. Door jumpers are petite, portable, and roaring good fun for babies. Choose one that has well-made clamps for optimal safety, and that has two bungee cords instead of one for maximum stability, if available. There’s more than meets the eye with this baby jumper. With a special three-stage activity design, your baby can have fun while developing motor skills and higher brain function. They’ll enjoy it for years to comes. We love that it supports a ‘whole body’ approach to play and learning. 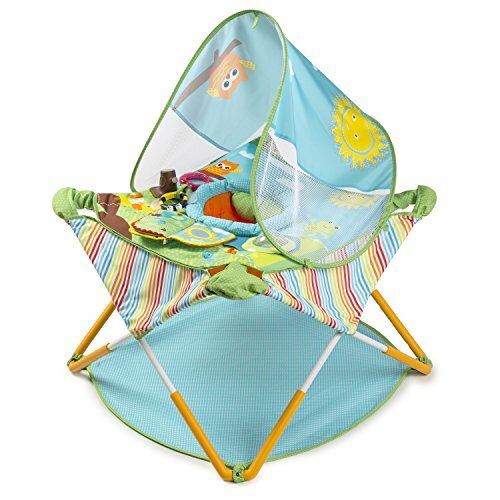 It features a 360-degree rotating seat, four movable toys with room to attach more, and a discovery window. This is one of the best features. The discovery window is a clear panel, allowing children to see their feet. Your child will learn about how the movement of their legs causes the jumper to move. They’ll also gain a better understanding of spatial awareness. All of this combines into three stages of activity. You can use it as a simple chair jumper that stays in one place, a cruiser that moves, and a stand-alone play table. Three-stage activity design gives you years of play. Discovery window increases spatial awareness. Some of the attached toys can catch your baby’s fingers. This jumper has no exposed springs so your little one’s fingers will be safe. The seat is removable and can be washed, and the rest of the BPA-free toy can be wiped down for cleaning. The frame is made of sturdy steel so your child can bounce without you fearing for their safety, and the seat adjusts to three different heights so you can personalize it based upon their unique size. Every aspect of this jumper should make worried moms feel more at ease about safety, including the wide base that is less prone to tipping over. 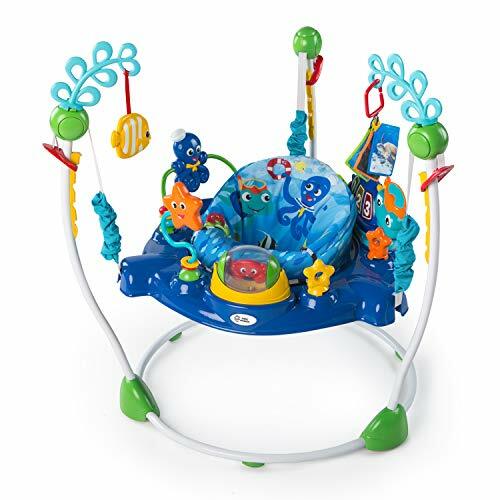 There are lights, sounds, and music to delight your child along with toys that will stimulate nearly all of their senses. The seat spins 360 degrees so your child can reach all of them. It has lights and sounds to capture attention. It does not require a door frame. It requires a lot of space. It only has three height adjustments. If you have a small space, it can be hard to find room for a full-sized activity center as they tend to take up quite a bit of real estate. Opt for a door jumper, a stationary jumper that can be easily stored, or an activity center that has a small footprint and can be stored flat. This jumper can actually take the place of three pieces of gear in your space-limited home, so it will offer activity through a variety of stages. 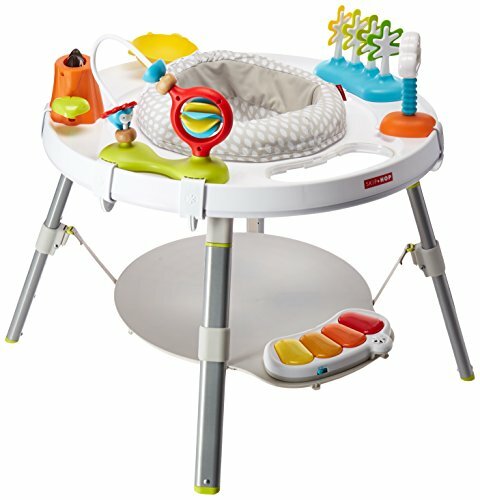 Not only is it an activity jumper with loads of toys attached, but it also can be used as either a playmat or an activity table, without the jumping feature. That means you’ll be getting more bang for your buck, so it’s a great choice for parents who are watching the value of what they buy. When using it as an activity jumper, there are three adjustable heights. It contains 11 toys and activities that are specifically designed to help your child with fine motor skills, object exploration, and tactile development. It has a removable soft seat pad that can be tossed in the washing machine, and the whole toy was designed, made, and assembled in the U.S.
It’s a 3-in-one piece of baby gear. It is made and assembled in the U.S. 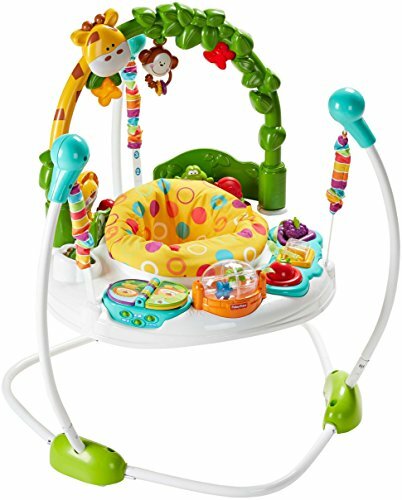 It has 11 different toys to keep baby entertained. It has a carrying handle. It only adjusts to three heights. It takes up floor space. This is all the fun of the classic doorway jumper with none of the risk. The saddle seat clips directly to a frame instead of a tension-set clip, which reduces the height from which it’s suspended and also the risk of product failure. It’s a good pick for safety-minded moms who feel other jumpers are a bit too risky. The seat itself supports your baby’s spine to facilitate proper posture, and the actual height of the jumper can be adjusted so your baby’s feet can be positioned properly on the floor. It folds down flat for easy storage or portability, and can be used either indoors or outdoors depending on where your family is spending their time. Babies may outgrow it quickly by height. It requires a large footprint in your living space when set up. It does not have additional toys to capture baby’s attention. Sometimes you’re on the go and you need a place for baby to play without getting full of dirt and sand. This portable jumper just might be the perfect solution for your active lifestyle. Arriving fully assembled and needing only to be unfolded, this activity jumper is ready to go at a moment’s notice. And it collapses just as easily — fitting into an included travel bag with shoulder strap. It can adjust to three different heights and even has a sunshade included, which is a great alternative to using sunscreen on your baby’s delicate and sensitive skin. And after your day at the beach with baby? Just pop off the seat and toss it in the washer to clean. It fits well with an active lifestyle. It’s not as durable as traditional activity jumpers. It may not be as stable as full-feature jumpers. 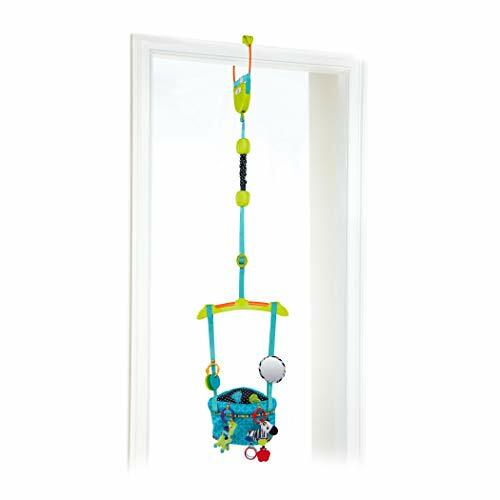 This economical option contains so many attached toys, it’s almost like an activity jumper that attaches to your door frame. The maximum weight for this one is 26 pounds, so your baby will be able to get enough use out of it to justify the purchase before they become too heavy for it. The spring itself is covered to help protect your little one from finger pinches, even though it’s well out of their reach, anyway. An adjustable strap allows you to change the height based on your child’s size to help promote better posture while jumping. 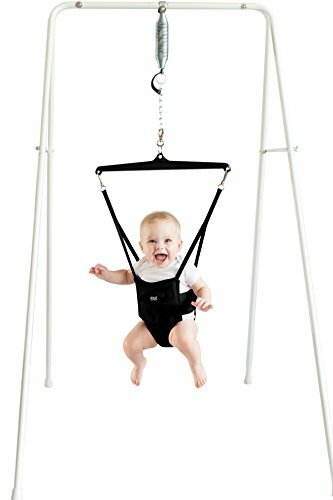 The two straps alongside the seat help promote stability, though the top strap and spring are long and could cause your child to swing a little more wildly than you’d expect — so make sure you supervise them in this jumper. It has additional toys for baby to play with. It includes a cushion to prop up smaller babies. The construction is not as sturdy. It may cause your baby to swing more than you’d like. Jumpers provide great fun for babies, and a break for their parents. They allow the child to play independently, see the world from a new perspective, and, in the case of activity centers, enjoy some new toys they typically don’t have access to when simply playing on the floor. They also give caregivers peace of mind, since they know the child is safely contained and not at risk of wandering or getting into things around the house. Babies should never be placed in a jumper until they have the strength to control their neck — usually around 4-6 months (source). 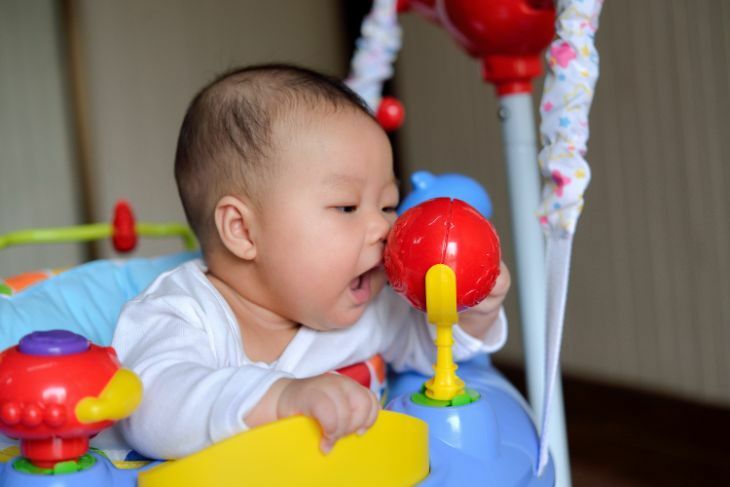 Because they are placed in a sitting position and the jumping motion can be a bit jarring, babies should only use a jumper when they have good, solid head control and their neck muscles don’t tire too quickly. In addition to that age threshold, each manufacturer outlines the age, weight, and height restrictions of its products. Follow their minimum guidelines for use, and never try to make your baby fit earlier than recommended by stuffing blankets or other things in the seat to make them fit more snugly. In addition to following your manufacturer’s age and size guidelines, there are some other things to be aware of when purchasing and using a baby jumper. 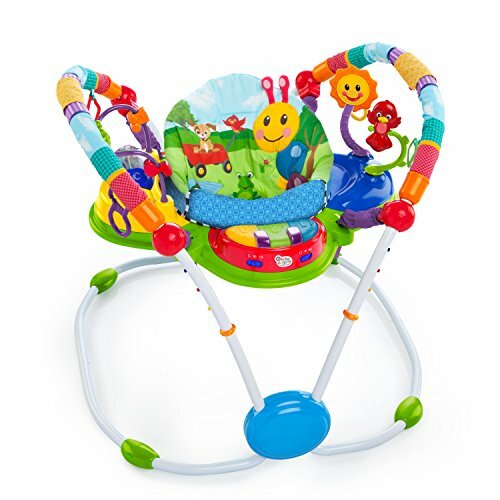 Duration of use: Though terms like exersaucer and jumper make it seem like your baby is getting exercise and working their muscles, the truth is that these devices have the potential to cause more developmental harm than good (source). Primarily because of the baby’s position in the jumper, it can affect their posture, hinder muscle control, and even delay walking. Limit use of the jumper to 15 minutes day to avoid potential developmental delays (source). Height position: Make sure your jumper is positioned at the proper height for your baby — they should not be flat-footed, nor should they be on their tiptoes. Pay close attention to the height of the jumper to ensure it is not in a developmentally harmful position. Dual bungee cords: Doorway jumpers tend to have the highest potential for injury — both from product failure like the clamps not being secure, but also from children bumping into the door frame from all the bouncing. You can minimize this risk by choosing a jumper with two bungee cords, which offers more stability and helps direct a child’s motion up-and-down and back-and-forth, reducing side-to-side bouncing or wild swinging that could cause them to hit the side of the wall. The challenge, however, is that these are not widely available. Alternatively, you can just use a standard jumper, but place it in a wide door frame. Moms deserve a break, and babies deserve some fun. A jumper offers the best to both, and is often baby’s most beloved piece of gear. Which one do you think your little one will love? Let us know which model you choose down in the comments below. We’d love to know!